I get asked a lot about what games I would recommend for two players. While I love playing with groups, I, like most other people, mainly play games only with one other person. Here are my favorite board games to play with my husband. A few of the games that I've included here might be difficult to track down, but I think they're all worth giving a try. Finally, these are ranked by how often we have played the game, not by preference. 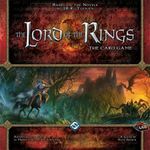 When we play LOTR:TCG, we participate in an ongoing story that we live through together. Players choose sets of characters from Tolkien's books and quest with them through plots and missions. As a "living card game," the base set can be built upon with expansion packs that feature new characters and quests. These quests are challenging, and succeeding at them requires a lot of communication between players. So, when my husband and I do win, we feel as if we have achieved something together. Initially, we picked up this game because I really love a tech tree - that is, a mechanic where you build a chain of abilities. Innovation offers that sciencey feeling that I was looking for because you play cards that feature innovations throughout history, such as the wheel or sailing. However, the game has kind of a silly bend to it. Each new innovation you play implements new rules, making it difficult to play toward a real overarching strategy. For this reason, we have found Innovation to be very fun and replayable. It's like eating kale chips. You know it's junk food, but there's still something wholesome about it. You may never have wanted to play chess with insects, but you should try Hive, because it's a perfect game. 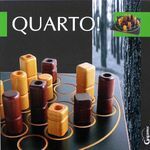 You get to play these wonderfully thick bakelite pieces and move them around as if they are beetles or ants, all while trying to trap your opponent's queen bee. Plus, it's super easy to zip up into a bag and carry around to coffee shops. If you do put it in your carry-on luggage, be warned that TSA might stop you and go through all your possessions. I guess it looked like a bomb in the scanner. Short or tall, dark or light, hollow or solid, round or square. Each beautiful wooden piece has one of each of these characters, and your job is to get four qualities in a row. It's tic tac toe with more complications and components that feel wonderful in the hand. In Race for the Galaxy, players start on an alien home planet and expand out into a galaxy of their choosing. You might start off on Old Earth and then play New Sparta and Space Marines. Soon, you are building a story in your card tableau. "My people got sick of Old Earth. They longed for adventure and bloody conquest. So, they moved to New Sparta and hired these marines to whip them into fighting form." All the while, you are competing against your fellow players for victory points. Steve and I have gotten a lot of play out of this game, and expansions keep being added to it. Dominion's deckbuilding mechanic is innovative and satisfying to play. You start off with the same cards as your opponent and gradually build your own deck by purchasing new cards and adding them to your discard pile. When your deck runs out, you shuffle all the cards in your discard pile to form a new deck. The physicality of this constant shuffling really appeals to both Steve and me. Dominion is fun to play with two, three, four, or even by yourself as an app. And there are many expansions to keep the variety lively. Since it's a small, easy-to-carry game, Jaipur was one of the only games that Steve and I carried with us when we drove from Toronto to move to Los Angeles. We got a lot of play out of it because it's light and there's really no set-up. It's not very competitive, and you play multiple rounds per game. We don't play it as much anymore, but I recently pulled it out and taught it to my mom. A nice starter game. Make a farm, feed your family, repeat. It's a simple idea, but, like life, there's never quite enough time to get everything done that you want to do. For me, that makes Agricola a really worthwhile puzzle. For Steve, it's completely stressful. A wonderful new app for this just came out that has solo, local, and online play. When we're feeling down or don't want to go through a game that's a big ordeal, Steve and I often set up Castles of Burgundy. It's still a game that requires building a competitive economy to acquire victory points, but it feels pleasant. Each player has their own mat on which they create an estate with castles, farm animals, sailboats, &tc. And you win by, essentially, making the estate that best produces victory points. When we play, it's usually a close game, and we've never gotten tired of it. I think abstract games are a great thing to have around if you're playing consistently with one other person. YINSH offers a real one-on-one challenge, and you as a player are choosing everything that happens on the board, from where the pieces go to what happens to them. Anything that happens in the game is a direct result of a choice that the players have made. Although it scales well up to five players, I enjoy Terra Mystica just as well with two. You play as a magical being (mermaid, dwarf, nomad, &tc) striving to terraform spaces on the board so that they become habitable for your particular species. Because there are many different species to choose from, the game is really replayable. 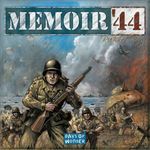 Getting into a war gaming takes a deep breath and a big step, but Memoir '44 allows players to gently submerge themselves in battle. With one side playing the allies and the other the axis, the game lays out many essential battles of WWII. I find playing both sides enlightening because I feel the loss of my troops, the difficulty of their attempts to assault a beach or defend a French city. Carcassonne stands as one of the very most popular games. But where it has players building out from a beginning tile, The Castle allows two players to build within from the outer walls of a city. I like the containment of this version of the game because it makes me feel closer to my opponent. Kosmos makes lovely two player games, and Odin's Ravens has sweet pieces of wooden ravens. A nice light game about racing from one end of a board to another by playing magical cards. Torres is a rare abstract game that scales from two to four players. It's completely satisfying to play because you get to enjoy the physicality of stacking pieces. In the game, players create castle towers and score them based on height and width. I like a small game like Love Letter for two. You play multiple rounds because someone wins quickly, and there are a lot of surprises. The game comes with only 16 cards, so there's really no set-up or put-away time. It's easy to just pull it out, laugh, and have fun anywhere. 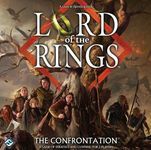 The Confrontation is like Lord of the Rings chess. One player plays Sauron, and the other plays the Fellowship. Each is trying to make it from their side of the board into their opponent's home space. Like Hive, pieces move according to their character. Sam, for example, can battle in place of Frodo if they are together. Boromir automatically kills his opponent but also dies himself in the process. A really sweet, light, two-player game, Balloon Cup is difficult to find now, but I would recommend anyone pick it up if they see it for a reasonable price. The components are darling, and playing is low stress because you're too busy thinking about beautiful balloons floating around to get mad that your opponent is screwing you over. Another gorgeous board. A Few Acres of Snow allows players to compete as the British and French sides of the French & Indian War, as we Americans call it. My Canadian husband learned about it as the Seven Years' War. 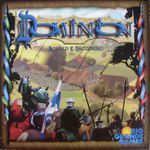 Incorporating Dominion's deckbuilding mechanic into a war game elevates A Few Acres of Snow from something pretty to look at into an intriguing two-player conflict. Claustrophobia is an easy to play but difficult to master dungeon-crawler. One side controls demons, and the other controls ordained convicts attempting to find their way out of a hazardous underground maze. The scenarios work well, and the tile-laying allows players to feel like they're questing without having to go through the trouble of putting together an RPG group.